In 1928 Dr. August Nagel, founder of Contessa and co-founder of of Zeiss Ikon, split off to start his own camera factory in his hometown Stuttgart. 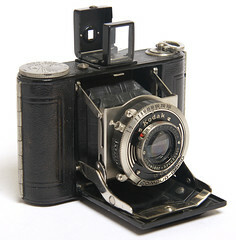 It became famous for its small format camera Nagel-Pupille. In 1931 the company became Kodak's German branch Kodak AG. After that, the model range continued with the Kodak name. In the mid-1930s, Dr. Nagel devised a 35mm film cassette that would fit the successful Leica and Contax rangefinder cameras; Nagel also shrank its earlier Vollenda camera to fit this smaller format—creating the Retina). Kodak in the US promoted this new film packaging as 135 format, and it soon became the 35mm standard that is universal today. Further Thoughts on August Nagel, by Larry Gubas, at Zeiss Historica, vol. 29, Fall 2007, pages 21-22. August Nagel and the Retina, by Peter Wallage, at Zeiss Historica, vol. 27, Fall 2005, pages 10-15. Zeiss Ikon and Dr. August Nagel (History), by Larry Gubas, at Zeiss Historica, vol. 6, Spring 1984, page 4. This page was last edited on 24 January 2018, at 06:15.